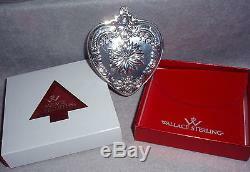 2005 WALLACE 14th ANNUAL GRAND BAROQUE STERLING SILVER HEART ORNAMENT. 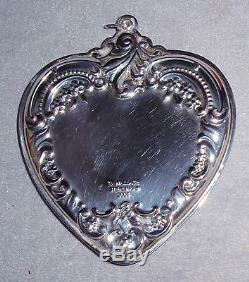 Heart Ornament Grande Baroque Flatware Pattern. Crafted in sterling silver, this beautiful 14th edition Grande Baroque Heart makes the perfect tree ornament. Includes the gift box and protective velvet pouch as shown. Double sided Heart ornament measures 3 3/4 inches tall x 3 inches wide. This annual edition ornament is the 14th in this collectible series and will not be repeated. Start a new collection as a thoughtful gift for a collector, newlywed, or for yourself with this highly collectable sterling ornament. This is in as new condition with original box, pouch, and outer sleeve shown. Only shows very light evidence of use and or polishing. As with all vintage silver, may require proper polishing upon receipt depending on your preferences. If by some small chance your item is not satisfactory, your return should still be received within 7 days or less. Be sure to check my other listings for many Christmas sterling pendant /medallion / ornament / charms, and other great gift items, Victoriana, Elegant Glassware, Vintage Clothes and Shoes etc. 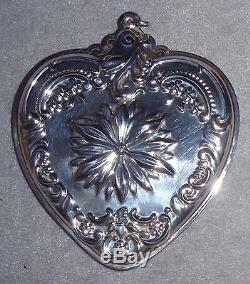 The item "2005 Wallace 14th Annual Grande Baroque Sterling Silver Heart Ornament Medallion" is in sale since Friday, May 24, 2013. This item is in the category "Collectibles\Holiday & Seasonal\Christmas\ Modern (1946-90)\Ornaments\Metal". The seller is "dkoldtiques" and is located in Barry, Illinois. This item can be shipped worldwide.